Not many musicians are as calculating as Andy Summers. His concise chord work and exacting rhythmic chops were key to the signature sound of early Police records. 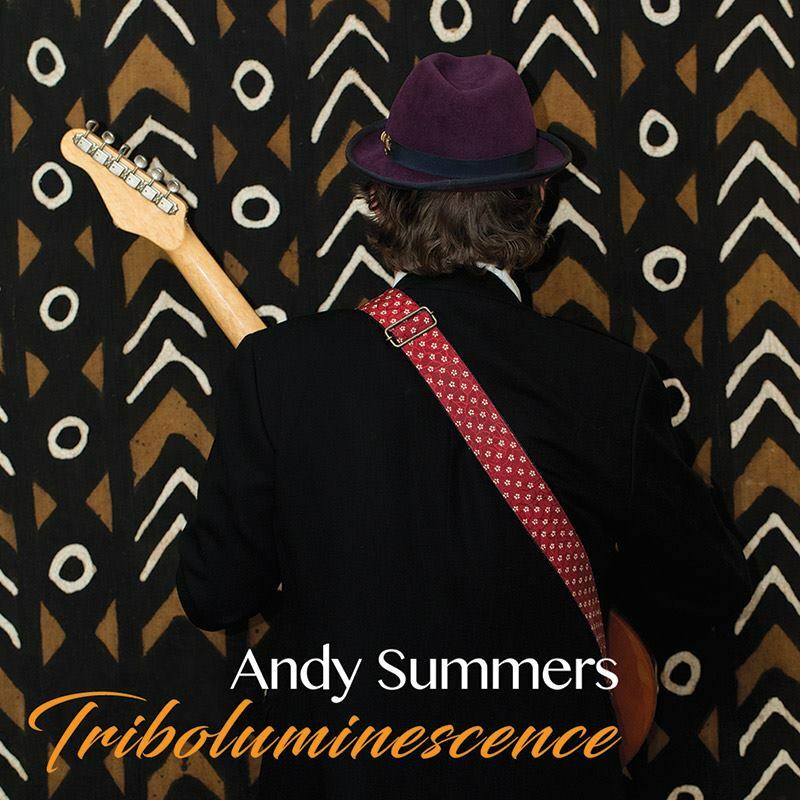 Summers clearly developed a similarly studied approach in the songwriting process for his two most recent solo albums Metal Dog and Triboluminescence, generating song ideas through careful experiments with guitar texture. In a recent phone interview, we caught up with Summers to talk about those solo albums and how the rapidly advancing music gear industry opens new creative doors. First and foremost, you've got a new album, Triboluminescence, your 14th solo effort. There are a lot of different influences on the album, from African music to Indian percussion. What went into making this one? With every album, you put as much thought and intention into it as you can. They're not just things you knock off. They take considerable effort, time, and thinking on many levels: artistic, creative, your place in the world, and where you're going as a musician. I'd love to hear about it. Triboluminescence, in a lot of ways, sounds like a natural extension of your last album, Metal Dog. The Metal Dog album wasn't really started as, you know, an album per se. It was started [as a collaboration] with an original artist in New York. I started writing music at that point, in my studio as always. That project didn't come to fruition, which pushed me to finish off tracks and make them into Metal Dog. As always, I was searching for new sounds, trying to get something really fresh and free of any standard genre. I was trying to push my boundaries while making it engaging and listenable, not completely avant–garde where it'll alienate everybody. Listeners really seemed to take to it. Did that reaction encourage you to further explore some of the experimental techniques you used on Metal Dog, like looping and using off–kilter rhythms? It got me fired up and compelled to continue on in that vein, somewhat. But [I was] obviously looking to see if I could take it and push it a bit farther, with the result being this Triboluminescence record. I'm always thinking about tones, and textures, and trying to make apparent that it's all intentional with a lot of different kinds of influences and cultures coalescing into a new musical statement. It is a somewhat guitar–driven album. Obviously I'm a guitarist, and the sounds you can make on guitar are vastly expanded from what you could make in the old days. As we all know, this is the golden age of guitar effects, so you can make some really great sounds with the guitar signal. But there's more to it than that. You're trying to make something free of cliché that turns you on. I don't want to make things that sound like 1971, man, I want to make things that sound like they're here. In making things sound like they're in the here–and–now, what types of gear did you find yourself gravitating toward? The Roland VG-99 is very good. I reprogrammed that box so everything's in a very comprehensive order. There are some great sounds in that. I also have the Fractal [Axe FX II] and you can dial in all sorts of sounds with that. And I have all kinds of pedals too. Just thinking of some off the top of my head, I've got a Zvex Lo-Fi Loop Junky. I just got a box in today. Christ, I'm coming up short. Don't worry, I put you on the spot with that one. I'm not too obsessive about pedals. A lot of them do the same thing. I'm really mostly interested in finding something that doesn't make a signal standard whatsoever. There are a few companies around now that are actually really doing that. They make pedals with crazy, outside qualities. One company I like in particular is Catalinbread. Really great people, really nice stuff, and they've probably got something for everyone. Then there's the Ditto Looper of course. The TC stuff is great. Another great couple of pedals I have are called the “Glitch” and the “Judder” and actually made in my hometown, believe it or not. MWFX is their name. A friend of mine from Los Angeles was playing in England, he called me and said “I found this fantastic pedal maker from your hometown.” I particularly like that weirdness and looking into those sort of things. Most of the stuff I've got is derivative: compressors, overdrive, fuzz, whatever. Not really fuzz. More like sustained distortion, I suppose. I've got several, many of these in different sizes and shapes. But a lot of them sound the same. With all this gear available to help make new sounds, can you walk us through your creative process? What I do is I sit right over a little table, which is like the pedal table, trying to find new sounds on the guitar. I like to be right up with them so I can tweak them, move them around. I'm very hands–on. That way I feel like it's drawing with a pencil. I know the process. They're not way down there on the floor or whatever. There is definitely a difference between guitars, too. My standard guitar is an old Stratocaster that sits on the couch that I pick up whenever I want to write. I start everything playing the Strat. And then, when I start with a track, sometimes I'll think to myself, “I need something more unusual. I can't be lazy.” I'll play my Stratocaster or my Esquire. I'll play them to get something different. My studio is a giant paint box. I've got all this stuff hanging around: guitars, pedals, pianos, keyboard, programmed stuff, percussion, two wonderful electronic drum kits in the Roland TD-15 and TD-20, which I love to play. I am very familiar with my creative environment. And believe it or not we're still on ProTools 8.5. We realize we're getting a little behind with it. The current version is ProTools 12. You bring up a good point in that sometimes it isn't worth moving away from what works for you as a musician. With that in mind, what makes particular tones, sounds or pieces of hardware more attractive to you than others? It's weird, isn't it? Why is it? I'm not sure there's a proper scientific explanation for this. I think it has to do with how you produce a note: the pick and strings, the signal, the amp, valves, the harmonics and sort of richness. Of course, you've got different pickups, too, with the front and the rear, the in–between sounds you can put out of phase. I always sort of liked out-of-phase sounds. My original Telecaster had a great switch that had incredible sound. I've never gotten it out of any other guitar. You hear a sound that you like, and I think that's why we revert to something we've heard that's already recorded. The tone somebody had, the sounds they had obtained in a recording studio, it's still thrilling. Obviously technology has progressed on, but not necessarily a tone. Because the right tone pierces your whole being. Tone is a musical statement, so take great care of your sound. When I was a kid, and not even at the beginning, I started with a Watkins amplifier and gradually progressed to a Fender Twin Reverb. So it was nothing but very judicious settings between bass and treble, and between the front and the back pickup. There you've got tone. Certainly as a teenager, I was very into getting tone from the amp, that's all there was. Tone is a musical statement, so take great care of your sound." Of course, like all guitarists, it's about what you want. There's a myriad of options that work better for some songs than others and catches your ear. I always try to get the overall shape of a track first, whether there'll be a B section, a C section. Once I have the basic picture of a track I'll think about tone and how to make it more interesting purely from an electric guitar point of view. Do you find that it's more difficult to think about “tone” with so many gear options available? That's a good question because you can't spend all your time drowning in a mire of options. You can go on forever. A lot of these tracks on this record, I start with a sound that's an idea that sets it in a certain direction. There has to be something about a sound that interests me, and then I'll write a whole piece around it. And then I'll think about the guitar. Interesting chord voicings, the right scale and melody, which takes it into a slightly different area into composition. Along with that, you can then start making the actual textures of sound, which is in its own way a lot like composition. It's quite creative to look around and try all your tones and it's really about combining pedals. But when you search for it, you have to have the knowledge that it's something fresh and that it thrills you. You can't plug into any old pedal for a solo. You have to think about it.